It was one year ago exactly that we were frantically cleaning and putting bits and pieces together to open to the public for one little Sunday – 22 January 2017. We had all of 9 staff hired across the kitchen, dining room and admin. And we felt pretty confident that this would cover it. We were very wrong. On that occasion and many more that followed. You came that day. We didn’t think you would, but you did. That next Wednesday as the restaurant opened again for its first full week of trade, I returned to my ‘real job’ as a High School Teacher. I made it to morning tea or so before I texted Martin, asking – ‘can I resign?’ Now it wasn’t that teaching wasn’t inspiring me anymore (it wasn’t) or that I didn’t really enjoy my school and my colleagues (I did), it was that I had spent every waking moment from November to January, thinking, painting, dreaming, painting, strategising, painting, purchasing and painting. And I couldn’t bear to not be there in all the action (and to finish the never ending painting). So two whole days later, after a ‘please, Accountant, say I can!’, begging session that provided me no assurances, I gave my resignation. And skipped back to Red Gum BBQ – fully committed and filled with all the anticipation and naivety of a new business owner. In those early days there was a fair amount of wild and crazy. With a retrofitted building up in rural, Red Hill – we ran out of water, lost electricity, wireless dropped meaning orders and eftpos quit and often – all at once. It seemed that if the wind blew or the temps rose above 30, our essential services took a break. And the amazing thing was, that despite all the mistakes and mishaps, people continued to visit and enjoy. From the moment we arrived, you exceeded our expectations and you continue to. There have been so many lessons of this year – so many highs and so many lows. Our children have spent too many hours wandering the spacious ‘shed’ and its parking lot. Our heads have exploded with the stuff we don’t know and the things that are hard. We have cried and fretted, fought and sweated. But there was never a moment when we would have had it any other way. Across this year we moved from 1 giant pit to 4. We’ve now got 25 employees from our original 9. And while we’ve grown in stuff and people, more importantly, we’ve grown in lessons. We’ve found another family in the people who work here. The young and old, unique, hard-working souls who make up the Red Gum BBQ family. It’s been a year of finding our feet and our people but they’re there now. When we go to work we feel safe, we trust and we have fun. And we are so grateful for that. And you – the people who visit us every day. You come with your kids, your Grandmas and your husbands. You celebrate bucks, birthdays and milestones with colleagues. You pick up lunches on your break, you invite us to cater your home BBQ and you bring your kids in after footy practice for a quick and relaxed family meal. You choose to spend your time and your money and your good will in our space and we love meeting you. You tell us you are coming back with your family or friends. You tell us that you loved the food and when you really make me tear up (and I do! ), you tell me how special our place is and how wonderful your time with us was. Through all of the hard, mostly, we are humbled and grateful every single day. People often ask – ‘could you have pictured this?’ and well, sort of. Did we think we’d be featured in 3 national magazines, with innumerable print, online articles and bloggers and shooting an episode of Postcards in a couple of weeks?! No. Those things are just too much. But could we picture ‘this’? Yes. We did. We were sure that if we could build the business of our dreams – extend Red Gum from tiny to enormous in the image in our mind – you would come. I suppose you shouldn’t put everything on the line if you don’t believe in what you’re doing. But could we picture ‘this’? No. Not this. Not how it feels when there are lines of people waiting to get in. Or when we look around at the people we work with and see them doing their thing – for each other and for the business. Or the table of boys, each with Red Gum BBQ hats bought by Dad for his son’s birthday. You let us celebrate all of our special holidays – Easter, Halloween, Thanksgiving and Christmas. We brought our family and you brought yours. And the community of businesses here on the Peninsula who support us in so many ways. We couldn’t have possibly imagined what THIS would feel like. So thank you. For making Red Gum BBQ what it is after 4 years and on its first birthday in our beautiful new home. And thank you to Martin for getting up at all kinds of wicked hours to cook BBQ and drag a pit around and keeping this thing going when I didn’t have the guts to. And for emancipating me. 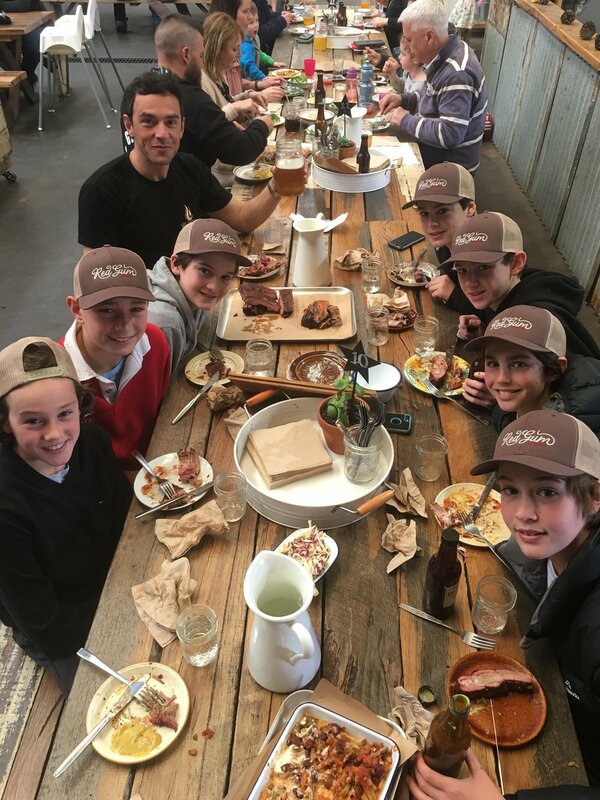 Thank you to Red Gum BBQ – our little gem that continues to challenge and inspire. Happy Birthday to you, you smokin thang.